Motto: Presenting oneself on the internet via websites is as important as the very existence of a not-for-profit organization. Who occupies himself with problems of the visually impaired and has his own web presentation, but this is inaccessible, poorly arranged, or not updated, he'd better not have any pages at all. e-shops based on PrestaShop system. All that mentioned above is, of course, created with regard to the accessibility rules concerning the visually impaired people and their special softwares. More information you will be given at web@eye-t.cz or call +420 775 376 378. November 2012 - New e-shop, created by Eye-T.cz, has been given to Tyflopomucky Shop, Olomouc (CZ), which has been selling various articles of daily use for many years - these articles shall help the visually impaired people to overcome the barriers caused by their impairment. Based on PrestaShop. 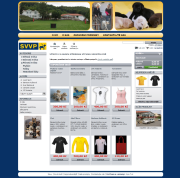 September 2012 - New e-shop, created by programmers and webdesigners of Eye-T.cz, has been given to the Czech Guide Dog School, Prague (CZ), which uses it to raise funds by selling small giftware and souvenirs. Based on PrestaShop. June 2011 - Web information made accessible to the visually impaired clients of the Regional Centre in Liberec, North Bohemia (CZ). Based on Joomla! 1.5 content management system.